Don’t let this cute little demure ground cover fool you. This is one tough little plant. 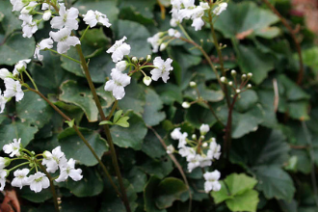 An evergreen mounding perennial that throws up 6″ clouds of white flowers in very early spring. So fresh and welcome along side other early bloomers for part shade to shade. Very slow growing to 1′ wide for rich, well drained soil with regular summer water. However, if you skip watering this little gem no harm will come. Incredibly drought adapted. I mean withering drought. And it may wilt a little but it seems to recover from just about anything. Deep green leaves. SE Europe.